An artist's depiction of a black hole. Scientists think that they've spotted a rare, Jupiter-size black hole casually strolling through the Milky Way galaxy. 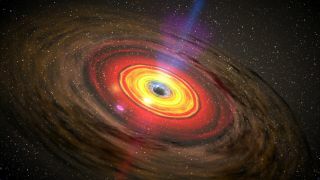 Of course, scientists can't see any black holes directly — but new research tracking a celestial cloud structure saw strange behavior that may have been caused by just such an invisible object. That data came courtesy of the Atacama Large Millimeter/submillimeter Array (ALMA), a set of 66 telescopes scattered across the Atacama Desert in northern Chile. "When I checked the ALMA data for the first time, I was really excited because the observed gas showed obvious orbital motions, which strongly suggest an invisible massive object lurking," lead author Shunya Takekawa, a physicist at the National Astronomical Observatory of Japan, told New Scientist. Takekawa and his colleagues were using ALMA to study two gas clouds, which the team nicknamed Balloon and Stream for their shapes, during a two-day period in May 2018. During that time, they watched the gas moving strangely, seeming to spin around a center. That movement allowed the team to calculate that 30,000 times the mass of our sun was packed into an object the size of Jupiter at the center of the movement. Those characteristics, combined with the lack of light coming from the location, suggest that the culprit is medium size for a black hole. Scientists think tiny black holes and supermassive black holes are pretty common, but that there aren't a whole lot of medium-size black holes. Astronomers believe they've spotted two other black holes in this size range near the heart of the Milky Way. All three, if future observations continue to see evidence for them, may be escapees from the giant black hole at our galaxy's center. The research is described in an article posted to the preprint server arXiv.org on Dec. 27.